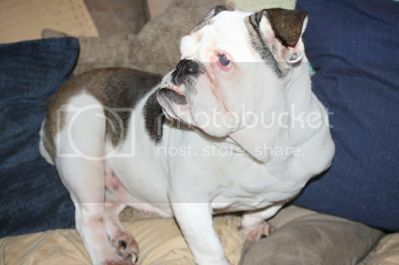 Meet Sarah, our puppy mill English Bulldog from Hungary we purchased from an online broker. Many wonder why we decided to start this forum. Are we a big corporation? A web developer? The answer is no. 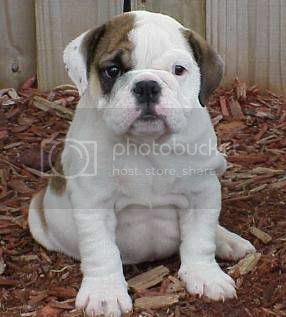 We started English Bulldog News because we had a passion for English Bulldogs. Once the internet became a foundation for finding answers to things, we wanted to start a forum where we could share this passion, and one where we could hold events and make things fun, to be more than just a forum- but a true bulldog obsessed community. 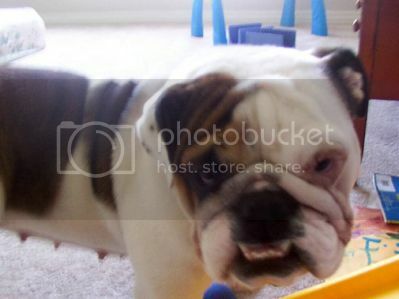 First and foremost, our mission here is to help rescue as many English Bulldogs as possible. How can we do this? By helping owners learn more about their breed, by helping future owners find the right bulldog for their family, by helping Bulldog Rescue Organizations place bulldogs for adoption, with donations, and educating others about Bulldog Rescue. By creating a wonderful place where bulldog owners, future bulldog owners, bulldog lovers, bulldog breeders, rescue and shelters, could strike up friendly conversation, ask questions, show off their bullies with photos & give helpful tips to other bully lovers in need. We believe that information and education is the most important thing all of us can provide for current and future bulldog owners. The idea of paying it forward and being here to give advice to all that come to us comes from Sarah. We will admit that many years ago we gave our beloved bully Sarah away. She was from a puppy mill in Hungary, (got her from an importer/broker-did not know any better) and had severe allergy problems once she turned about a year old. We did everything we could with the help of our veterinarian. She was allergic to almost everything seasonal- molds, droppings, dust.... and she was also allergic to 20 different foods. She would rub her face so much it would bleed. After the allergy tests came back, we proceeded with the allergy shots. As you can see from the above picture, Sarah was miserable with allergies. We had her wrinkles surgically removed from her face so that they would no longer get infected. We fed her the Rabbit prescription diet the vet gave us for her. But we did not know enough about how to care for her properly, even though we tried our hardest. Sarah after getting her nose rope wrinkle removed so her face could breath. At the time, we were traveling all throughout the USA for our job, and she was miserable in many places that have high allergens. Her allergy shots were based upon where we lived, so as soon as we left Tucson she fell apart. We felt that we did not have what it took to give her the home she deserved, and making her travel was not good or fair to her. We did not know what we could do. The shots, prescription food, meds, steriods- they were not helping her. Eventually, we called our dear friend who we knew could give her the care she needed. 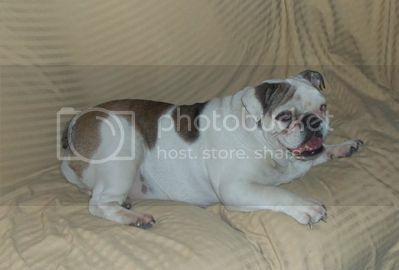 This dear friend of mine worked in bulldog rescue and dedicated her life to the breed. Many of you may frown upon us for doing this, but we did it because we loved her like crazy and we knew our friend could care for her better than we could. If only we had known then what we have learned here at English Bulldog News. Not from ourselves- no. From what we have learned from our members and fellow bulldog owners. We are certain we would have never made that choice to let her go. If we would have had the tools and support we needed to care for her, she would still be with us today. We now know that the website we purchased her from is an importer. We did not know or understand that she came from a puppy mill. Another reason to tell our story. I do not for one second ever regret getting her or letting her go, but I feel it is very important to share our story with others. There will always be people out there with questions that need the help of other bulldog owners, and we will all be there for them when they do! No, Sarah never ended up in a rescue, but how many of them do? 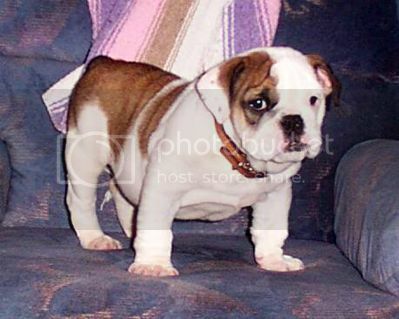 Simply because the owners are not prepared with the information they need to care for an English Bulldog? Because the owners just throw their arms up in the air and say, "I give up!!" I can tell you it is far too many. If we can help just ONE owner with useful information or advice, maybe that bully will not end up in a shelter or rescue, and all of the hard work we put into the site everyday will be worth it. If we can help ONE shelter or rescue place a dog, then again, it will all be worth it. If we can donate even just ONE dollar to a rescue, it will surely be worth it. If we can save just ONE bulldog, it will, without a doubt, all be WORTH IT! This article, and website, is dedicated to our Baby Girl Sarah Smile. Don't be fooled by an adorable picture on the internet. This is Sarah's internet picture. The one that got us to 'order her online'! All bulldogs are sweet and adorable- but you should never purchase a bulldog over the internet via a broker or from a pet store. This is Sarah today. She is doing wonderfully and is a ripe old age of 9. She is now on a great diet, almost allergy free, and living in Tucson with one of my best friends who spoils her rotten. She is losing her eyesight but is still very playful and sweet as ever! Sarah is now 11 years old. She continues to be proof that if you find the right food and care, even an unhealthy puppy mill dog can live a very long life with the right care and food. This article has been revised to give a bit more history on our baby girl Sarah. This is what this site is all about,given ideas and learning from others.Helping each other to understand our beautifull bulldogs and becoming a family even when we have never seen each other! I m glad you posted this again so that new members understand the basis of English Bulldog News. it isnt about who is wrong and who is right ,its about giving the best informed advice and making the best desicions based on what is best for you and your English Bulldog. All I can say is ... wow. This article really touched me. It brought me back to the first couple of months with Stig and we really didn't know what to do. He suddenly developed hives and a hot spot that kept on getting worse. We were literally at the vets about once every couple of weeks, at times even weekly, for both follow-ups and new concerns (mange, ear infection, etc), spending a lot of $$$ on the appoinments, tests and the meds. Then I came to this site and learned that food is the most common cause of allergies. It took another couple of months until we found what was best for him but you should've seen our amazement how quickly everything turned around. The hives that suddenly appeared out of thin air also disappeared in an instant. My bf and I can never thank this site and its members enough! What a wonderful article! So sad to know there are SOOO many "saras" out there who's life stories did not end so well but I hope thanks to EBN there will be more happy endings for bullys in the future! Wow! I am so glad Sarah is having a good life and glad for her part in the motivation to start this site. 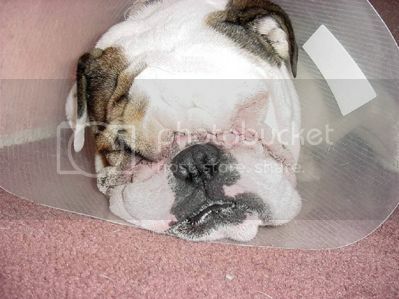 Her story is helping lots of Bulldogs and Bulldog owners. That is an amazing story!! Really tugs at those heartstrings. That is why I love this place...we are all here for each other and learn together on our journey to give our babies the best, most fullfilled lives possible!!! Thanks EBN!!! I think all the "ONE" goals have been met many times over! Wow..great story. Sara was a lucky dog..to have had you care enough to do the best for HER. She is STILL a very lucky dog to have someone taking such great care of her. Most of all..WE are lucky to be able to learn from you. Wonderful story and she looks beautiful now!! Such a valuable story. So much good has come from it! And I am so glad to see that Sarah is a happy, healthy, and spoiled bullie! This story really touched my heart. Thank you for sharing! This is such an awesome project! I'm so happy to be a part of it! And Sarah, wow! What a trooper! Wow....what a touching story. She looks amazing. Wow this story was amazing! Truley touching story and so so glad I joined this group! The passion you have to do what you do is truley outstanding! Thank you for allowing us to be a part of this group. What a story! so many bulldogs have been helped and saved and many more will be thanks to Sarah and Lisa and every member on here. I love this place! wow what a story and i love this site. it has helped me care for sarah and not be at the vets every 2 weeks for something. i appreciate all that lisa has done and will do for bullies and everyone here who helps make just one bullies life better. Lisa, thanks for putting this up for those of us who have only been around a little while. Your story touched my heart and I read with my breath held wanting to know how everything turned out. What you have done with this site and what you contribute each and every day by having a forum for all of us to come together is nothing short of amazing. I know it takes a great team to put this all together and keep it going and you have many angels who give their considerable time and talent to this. But without a visionary things don't get started. You are truly a visionary and I am so proud to be a member of this remarkable community. A community that you began. Thank you. Been a member here for a few weeks and still finding my way through the site, so I just found this post today. Fantastic article and from I've seen so far I believe you can use a phrase from one of our former Presidents (only yours would be true)....Mission Accomplished! I still have a lot to learn about these fabulous animals, but every night after some reading here I have either learned something or been reminded of something. I, and my boys, appreciate the site and everyone that's part of it. This is a touching story. I know it must have broken your heart to give her up. A very courageous decision-to do the best for your little girl, and a wonderful friend to do the best for her,also.